Notejoy allows you to have threaded discussions about a note within Notejoy's Chatter. Too often we see these conversations happening in email, Slack, or elsewhere. 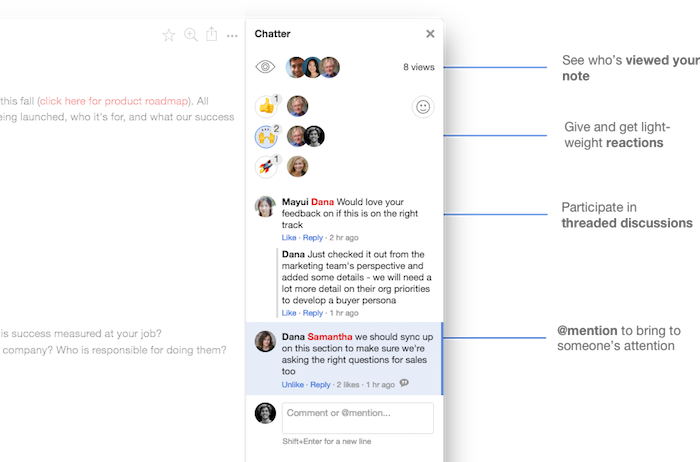 So we wanted to design an experience that allows you to have the full discussion right next to the note. Any viewer can create a comment and others can easily reply to those specific comments, creating a threaded discussion. Note authors and other commentors are automatically notified about new comments. We also allow you to archive comments to hide comments you've dealt with. This will hide the comment within Chatter. But you can always get back to it if you need to in the archived comments section at the bottom of Chatter. To archive a comment, hover over the comment in Chatter, click the dots, and press Archive.